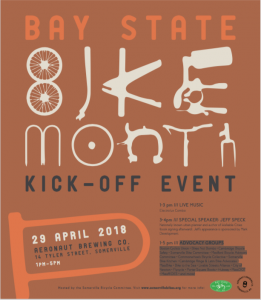 Bay State Bike Month Kick-off – Bike to the Sea, Inc.
Bike to the Sea will be sharing a table with the Medford Bicycle Advisory Commission at the Bay State Bike Month kick-off. Event includes live music by Electrolux Combo (1-3 PM), a speech by Nationally known urban planner speaker Jeff Speck and representatives from over 15 bicycle advocacy groups. This is a good opportunity to talk to Bike to the Sea board members and find out more about the recent state grant. Event is at Aeronaut Brewing Company, 14 Tyler St, Somerville.